Jund is back. After months of neglect at the hands of Abzan players everywhere, Jund has returned to the spotlight as a tier 1 deck. We made this official in early May, classifying the deck as tier 1 based on its consistent paper and MTGO performances, and we have continued to see it succeed in events throughout the month. I fully expect this trend to continue into the summer as Abzan continues to decline in popularity and value and Jund continues to prove it doesn’t need no stinking Elves (RIP Bloodbraid and Deathrite) to succeed in Modern. But many players are wondering about why Jund is so strong in this current metagame. What is behind its success? Why should you be playing it or fearing it? This article gives you the background on why Jund is so strong in Modern right now and why you should either sleeve it up or get ready to face it in the June GP circuit. In this article, I’m going to present three cases for Jund’s strengths, both relative to Abzan (the “other” BGx option in the format), and in the general sense of the format. To summarize, these reasons include a less painful manabase, the renewed importance of Bolt, and increased viability of Dark Confidant. All of these factors have been decisive in Jund’s return to glory, and you need to understand them whether you are playing with the deck or against it. They also get at the general metagame context of Modern, which is important for every competitive Modern player to understand, particularly if you are translating these lessons to your own deck (e.g. the relevance of Bolt in Jund informs the relevance of Bolt in UWR Control or Grixis Delver). So whether you are sleeving up those Bobs again, opening them and Goyf off your MM2015 weekend, or just getting ready for the upcoming summer Modern season, this article will give you tools you need to understand Jund. Before we get started, here are two recent Jund lists illustrating the different principles I’m talking about in the article. The first was piloted by Frank Moon to a 4th place finish at SCG Premier IQ Worcester this past weekend. Moon navigated a diverse field of 273 other players en route to his awesome 4th place finish. He was joined in the Top 16 by 3 other Jund players, all playing similar decks. As another Jund example from this last weekend, Gerry Thompson piloted a slick Jund build during the Modern rounds of the Standard Super League. His list shares a number of qualities with Moon’s, and he took the deck to a 2nd place finish before losing in the finals to Jund’s archenemy, RG Tron, in a 1-2 showdown. With the lists in mind, now we can turn to the big three reasons explain Jund’s success in the current format. Atarka’s Command might not have led to the overwhelming dominance of Burn decks everywhere (as so many in the Magic community feared), but it has definitely solidified Burn’s place as a tier 1 deck. Looking at the recent metagame stats, Burn is still a top 3 deck, and although its paper share has declined in recent months, its still at the top of the MTGO charts. When we add Affinity, Grixis Delver, Merfolk, and the many and numerous iterations of Zoo, we are looking at a solid 20%-25% of the tier 1 and tier 2 metagame that’s actively trying to smash your lifetotal. These decks are very punishing for Abzan, a deck relying on three-colored manabases packed with fetchlands and shocklands. But Jund has one thing these decks don’t have, an ace-in-the-hole so innocuous and yet efficient its one of the big three reasons why Jund is gradually climbing up past Abzan: Blackcleave Cliffs. This isn’t the first time we have seen Scars fastlands in rising tier 1 and tier 2 decks. Both Grixis Delver and Abzan Company use them to great effect, ensuring painless turn 1 plays in a format rewarding powerful turn 1 plays. Jund has been using Cliffs longer than both of these decks, but it’s only in recent months that Cliffs has seen renewed relevance in a metagame overrun with aggressive, proactive, and linear strategies. 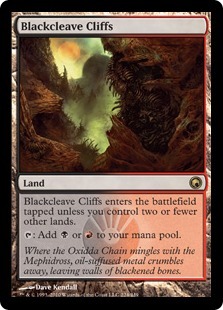 Cliffs is also actually BETTER than the other fastlands, both in Jund itself and relative to the rest of the format, because of the turn 1 plays it enables. Jund is the best deck in the format that can abuse the painless turn 1 Lightning Bolt and Inquisition of Kozilek. All other decks either need to spend life to do that (e.g. Grixis Delver), or don’t have access to one card or the other (e.g. UWR Control vs. Abzan). But the ability to have these turn 1 plays at no life cost is enormous. It gives you flexibility against all the aggressive decks in the format without trading any manabase development in the less aggressive matchups. Cliffs is also the context that lets you use Confidant (see Case #3 later in the article) with such success. Given how the format has been evolving, with more decks light to Bolt and Bob, Cliffs is really the foundation of why Jund is so successful. In Cliffs, we also see the reason why Abzan’s share is declining. Abzan’s manabase may have been made more efficient with Windswept Heath out of KTK, and Abzan may still have some anti-aggro measures in turn 3-4 Siege Rhino. But that’s just enough to make the deck viable in this format. It’s not enough to make it better than Jund when the format is really pressuring your life total and emphasizing the importance of turn 1 Bolt. If Abzan had a fastland like Cliffs, a lot of these pressures would be lightened. Abzan would still struggle with the other issues (no Bolt and no Bob), but it would at least have the lifetotal to bolster those issues. But without such a land, Jund really takes the lead as the frontrunning BGx deck capable of fighting aggressive opponents while still exhibiting the customary strengths of a BGx deck. A few weeks ago, I talked about Bolt’s increased importance in Modern. This is even more true today than it was then, with the rise of Elves and Abzan Company, the decline in Abzan, and the staying power of Burn, Affinity, and Grixis Delver. Bolt is just really dang good in Modern right now. To some extent, as I talked about in that article, Bolt was always pretty good in Modern, even if the Abzan mages shied away from it around PT Fate Reforged. But in many respects, they were punished for that decision with the return of Infect (also powered by the newly released Become Immense, and the overall saturation of the format with linear strategies. But the results are now in and the verdict is clear: Bolt is very strong in this format and only getting stronger. The decks successfully wielding Bolt will be the decks succeeding in Modern, and Jund is at the top of that pack. If I had to highlight one reason for Jund’s recent successes before the rest, it would be Bolt. Affinity, Burn, Elves, Abzan Company, Merfolk, Grixis Delver, Abzan Liege, and a number of other Lightning-rod decks constitute at least 30%+ of the metagame at this point. And of those, Abzan Company and Elves are only poised to keep rising (or are just overhyped, in which case you will still expect to face lots of them). This creates a situation where Bolt is indispensable. Bolt’s value is bundled in the concept of removal “parity”, i.e. the ability for removal to trade at equal or greater value with opposing threats. Bolt is the litmus test of removal parity in Modern. For one mana and zero drawbacks, you can kill everything from a 1-drop Noble Hierarch to a 3 drop Elvish Archdruid or Pestermite. Not to mention all the Blighted Agents, Inkmoth Nexuses, Anafenza, Kin-Tree Spirits, and Young Pyromancers in between. These creatures are rampant in the format and, particularly in the case of the new Company-powered decks, high value targets that need to be killed immediately. Jund is not the only deck that can do this: any red-based deck, including UWR Control, Blue/Temur Moon, Scapeshift, etc. can do this too. But Jund is the only red-based deck that also has the black disruption arsenal of TS/IoK/Decay, and the efficient beatdown in Goyf and Scooze. As with the Cliffs case, the rise of Bolt also hints at the decline of Path. Path is great in a metagame where it’s blowing up big fair threats for just one mana. Nothing stinks more than walking your Wurmcoil Engine down the opponent’s Path to Exile. But Path is also one of the worst removal spells in the competitive format at trading at parity with low-cost threats. Pathing a Bird or Hierarch is probably one of the worst removal plays you can realistically make in Modern. Sure, you can kill them without drawback for 2 mana using Decay, but now the Abzan mage has spent 2 mana and their entire turn 2 to kill a 1 drop Bird. As someone once said, your removal didn’t kill the Bird. Their bird killed your removal. This is particularly true against Company decks, which will happily convert the basic land into a guaranteed turn 3 CoCo flipping 2 creatures. Good luck handling that with poor Lily. Of course, this doesn’t mean Path is totally without utility in this current format. Path is great at disrupting Abzan Company and its graveyard-based shenanigans, just as it remains relevant against the fairer decks like Jund and Abzan (Pathing Goyf is always a great exchange, bonus points if it’s Tas). Tron is also likely to return with Jund’s own rise, which will further shore up Path’s relevance in Modern. But despite Path’s utility, Bolt just has more utility in the format. As a final note on this, Jund doesn’t find its contextual strengths because it’s running Bolt in place of hard removal. Bolt still doesn’t kill Goyf today any more than it did 6 months ago. Jund’s strength is it can run Bolt alongside the traditional hard removal of Abrupt Decay and Terminate. This gives Jund the flexibility to kill both smaller creatures that need to be addressed on turns 1 and 2 without incurring drawbacks, and then the midgame ability to kill bigger threats Bolt can’t hit. Abzan falls short in that category. They tried to kill you, oh Dark Confidant, but you refused to be silenced! It’s very fitting Bob has returned in MM2015 just as Jund has started to make its big 2015 Modern comeback, largely because Bob has played such an important role in the deck’s rise. Whenever Bob is gone, I always see questions arise like “Why is Bob gone?” or “When will Bob come back?” The current rise of Jund is a great case study in factors that enable a Bob-friendly metagame. Although I wouldn’t go so far as to say this is the most Bob-friendly metagame we have seen (screw you, Burn! ), it’s still a lot more hospitable for Bob than most metagames we have seen to date. This is largely a function of metagame context. From a contextual standpoint, there are two factors influencing Bob’s viability in Modern. The first are the decks he plays against, and the second are the cards he pairs with in your own deck. I’m going to start with the first because this larger metagame context is so integral to the rest of Jund’s success (see Cases #1 and #2), and it’s a great entrypoint to the internal factors. There are a few matchups (and, by extension, metagames) where Bob is bad. These include hyper-aggressive decks that punish life totals, such as Burn or Affinity, and removal-heavy decks that can kill Bob at parity, such as UWR Control or UR Delver. This made Bob absolutely terrible in the Treasure Cruise era of Magic, where you were dealing with a metagame that was almost 25% Burn and Delver alone. You can also flip this metagame context to see situations where Bob is much better: grindier metagames with less efficient removal. Decks like Pod and Abzan Company are terrible against Confidant because they can’t reliably remove him and tend to get buried under the card advantage he generates. But even if those decks are present, as they were from October 2014 through January 2015, Bob can still lose relevance if the aggressive and high-removal decks are too common. The current metagame has a great mix of decks that beat Bob and decks that get beaten by Bob. Burn and Grixis Delver are the decks you really don’t want to drop Bob against, but they also make up less than 20% of the metagame, so you can hedge your bets there. Then there are decks which can’t do anything about a Bob and get punished hard by their lack of interaction: Infect, Amulet Bloom, Abzan Company, Elves, etc. These matchups are where Bob will shine. Finally, you have decks that can kill Bob, but will also lose to him if they miss removal. This includes Twin and its variants, UWR Control, the Grixis/Temur/Blue Moon variants, etc. Sure, Bob dies in those matchups all the time, but a stuck Bob will probably be game over even if it’s just for 2-3 turns. Abzan and Abzan Liege are in special categories here because although they can kill Bob, they can’t do so without giving you value. Either they trade straight up with Decay, or they develop the Jund boardstate with Path. Either way, you emerge ahead here, particularly off a Path. All of these are contextual reasons why Bob is so strong right now. All of this begs the question: why can’t Abzan run Bob too? In turn, this gets at the second set of reasons as to why Bob is so strong in Modern, which are the internal, deck-specific ones. As anyone who has tried to play Bob in Abzan can attest, Bob doesn’t play nice with Abzan’s expensive spells. Rhino, Tas, Lily, and Souls are all expensive cards that regularly hammer your life total if flipped of Bob. Rhino and Souls are also THE reason to play Abzan in the first place, so you can’t just cut those cards if you want to play Bob. By contrast, Jund runs a cheaper curve. with only 1-3 creatures at 4+ mana (typically some combination of Olivia Voldaren, Batterskull, and/or Tas), and most of its spells at 1-2 mana. This means Bob’s flips are far less painful, making Bob a much better inclusion in Jund than Abzan. By a similar token, those other cards themselves are worse now than they were back in January and February. Abzan is at its best in grindy metagames where Souls and Rhino are just too much value for most decks to handle. We are not in such a metagame right now, which makes the cards comparatively worse. In turn, this eliminates a need to play these cards, shifting the BGx burden back to Jund and its prince, Mr. Confidant. If I had to pick a “best deck” for the GPs in June, it would definitely be Jund. It’s truly a 50/50 style deck, capable of supporting favorable matchups against the broadest selection of decks in the format. Against combo decks, you have hard removal, discard, and a clock. Against aggressive decks, you have efficient removal, defenders, and lifegain. Against grindy decks, you have high-value threats and ultra-efficient interaction. Abzan is better at some of those things than Jund (especially in fairer matchups), but Jund makes up for that in its breadth of strong matchups. It also compensates for those weaknesses through old staples like Confidant and new tech like the awesome Kolaghan’s Command. As if Jund needed more value! Command recurs creatures, gives you maindeck game against Tron cards like O-Stone, Affinity, and other random artifacts, and helps you blow up those smaller threats. Indeed, it’s cards like Command, Terminate, Ancient Grudge out of the sideboard, etc. that are other contributing factors to Jund’s recent successes. In presenting these three cases, I don’t want to underplay the strengths of cards like Command, because these are also decisive in Jund’s newfound relevance. But the three factors highlighted in this article are, in my opinion, the biggest three you need to consider when facing Jund or getting ready to sleeve it up. Command and Terminate are important, but you aren’t playing Jund for these cards. You are playing it for Bob, Bolt, and Blackcleave. I’m looking forward to seeing what Modern Jund can do throughout the June GP circuit. As I’ve said before, never bet against BGx, and right now, it looks like the Bolt, Bob, and Goyf-powered Jund is exactly where you want to be as a BGx mage. Hello dear Sheridan. How possible, in your opinion, is a Bloodbraid UNban during the next ban/unban phase? As I can understand from your article you consider it HIGHLY unlikely to happen. Why is that and why? Poor Bloodbraid. There’s a case to be made that she as an unwitting victim of Deathrite Shaman, and she probably shouldn’t have been added to the list in the first place. Similarly, there’s a case to be made that just as Abzan has Rhino, so too should Jund have BBE. There are strengths and weaknesses of both arguments, as well as all the other arguments you typically see about (un)banning the card, but I think this really all boils down to the metagame. BBE is a card that powers up Jund and Zoo decks. If those decks need help, then BBE is a great candidate for unbanning. Unfortunately for her, those decks don’t appear to need much help now. Zoo is finding new uses for Collected Company every day, and Jund is doing just fine with its old toys and a few new ones. This suggests that a BBE unban wouldn’t really be necessary at this point, particularly because the format is still stabilizing and shifting after the bans in January. 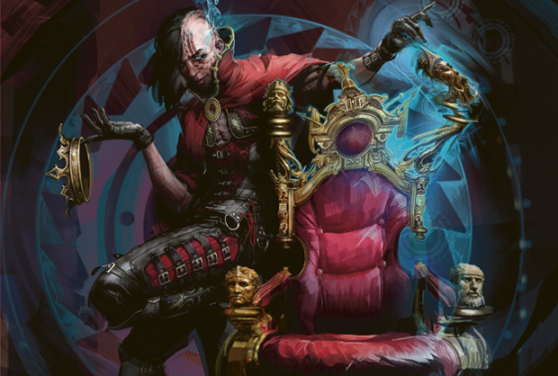 Wizards wants the format to keep its diversity, and BBE could definitely unbalance that. Even if it might not, the RISK of it happening is probably too high for Wizards, and unbanning is nothing more than a cost/benefit/risks/opportunities analysis to begin with. In Wizards mind, the potential costs are probably just too high. Thanks as usual for the article. One interesting thing I noticed is that neither of the decks you posted above include Huntmaster of the Fells, which has been a staple in the vast majority of Jund decks I’ve seen. Why do you think that is? Very insightful article! I switched to Jund form Abzan before it started rising in popularity and came to similar conclusions: JUND ‘EM OUT! So, you mentioned ancient grudge in the sideboard at the end of the article, and I question its importance with Kolaghans Command already being played. I have found that KolComm tends to destroy the decks you would board in grudge for anyways. Is it just for better reliability? I’d add it as a 1-of. Maaaybe a 2-of in an Affinity-heavy local metagame, where you know people are playing that deck a lot and you are guaranteed to play them. Otherwise, it’s just your one anti-Affinity bullet. Between Grudge and Command, you’ll have more than enough cards to handle that matchup. It’s also randomly strong against a bunch of other artifact-based decks.